On Bert Marsh's recommendation, Mark and I visited Peter at his fully equipped workshop and studio in Ditchling, East Sussex. I did some preliminary research into Peter's work, textured and coloured in its appearance, and I was very much looking forward to meeting him and seeing his work in the flesh. The Turner Dumbrell workshops, where Peter is based, are a group of workshops that were converted from previous farm buildings back in 1985. These workshops are now let by the Trustees of the Turner-Dumbrell Foundation to people engaged in art or craft work who are in business for the first time. Peter's workshop is situated near his home in historic Lewes, about eight miles away. I was interested to hear about how Peter got to where he is now, so I started by asking him about his background. Born in Brighton, Peter's creative career started at Art College where he studied fine art painting, but he chose to drop out, being lured by the good light that Shetland offered. He originally went to Shetland for a holiday but decided to rent a cottage there and continued to stay on and off for the next eight years. To make a living, he decided to start making agricultural gates, which was his first foray into joinery and woodwork. He continued on this path for the next 25 years. 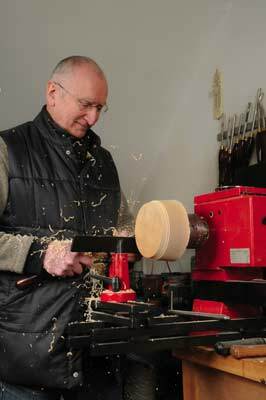 It wasn't until the mid-1990s that Peter decided to take up turning full-time after having seen a few craft fairs and experiencing some lathe work. He decided to contact Kevin Hutson, a now fellow woodturner, for some advice and they have remained friends to this day. Peter tells me that he hasn't painted at all since leaving college. This influence, however, definitely comes through in his bowls and vessels, where he applies surface texture and paint to a 3D surface rather than a 2D canvas. In this sense, he has never stopped painting. A self-confessed gallery turner, Peter's pieces are all one-offs; they are not batch produced. Last year, surprisingly, was actually his best year in terms of sales. Despite the recession Peter sold a number of works. "This year is a little slower, but it is always a difficult time between Christmas and Easter," he says. 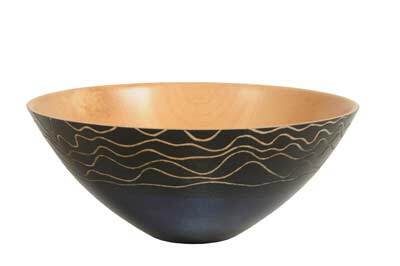 Peter's pieces are made from temperate hardwoods and his body of work includes vessels and bowls that are stained, carved and finely finished, using both oils and waxes. As Peter's pieces display colouring and texture, people often assume that they are made of ceramic or metal, but this, of course, is not the case. Peter's pieces are made mainly from dry sycamore (Acer pseudoplatanus), a timber which he can easily source. It is a relatively inexpensive wood and he finds it a pleasure to work with. The pieces consist mainly of smaller vessels, but Peter tells me how he is starting to make bigger pieces using green wood. In fact, he has just bought a new electric chainsaw to facilitate this. "Mainly, my pieces are 75-100mm (3-4in) high. I mostly work with kiln-dried sycamore, but I occasionally use horse chestnut (Aesculus hippocastanum). Maple (Acer campestre) is another possibility given its paleness and density, but as Peter tells me: "It's a more expensive timber and I don't think it would make a sufficient difference to the work to warrant the extra cost." Mark comments on how Peter's pieces also have an oriental feel to them, but according to Peter, this is not intentional. "I used to experiment with weird and wonderful shapes, but now I have distilled my repertoire down to a few distinct shapes that people will hopefully be able to recognise," he explains. Peter has a number of techniques which he uses to produce the patterns and textures on his pieces. He tells me how masking tape and masking off certain areas help to create the distressed look which many of his pieces feature. They are then finished with Danish oil and wax. 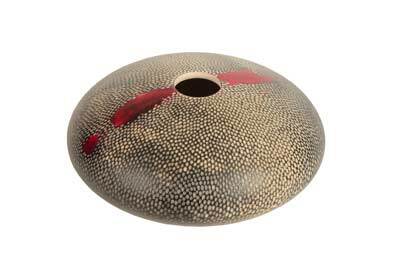 He has an interesting technique of placing a band of colour at the bottom of the vessel, notably just above the foot of a bowl or hollow form. Although a technique often frowned up, Peter has demonstrated that this method actually helps frame the piece, contrary to popular belief. I get the impression that Peter likes to experiment and push the boundaries, allowing his creativity to flow, thus creating a playful sense. And it works. I absolutely love Peter's hollow form vessels with the minute hand-written detail. Applied using a very fine black pen, Peter adds this handwriting, which from a distance actually looks like a pattern as opposed to written words. It is only when you get closer that you realise the piece has hidden depths and dimensions, making it even more intriguing and tactile. Staining is another example of how Peter alters the tactility, colour and texture of a specific piece. Some pieces also feature a great deal of carving, a time consuming addition but one which adds more value and depth to each piece. "All the carving is added on the lathe using gouges. I don't do any power carving, but I would like to look at possibly using a reciprocating carver in the future," he tells me. Peter's workshop can be reached by climbing a staircase at the side of a converted barn, and although small his workshop is perfectly formed, built for efficiency with everything having its purpose. He makes excellent use of space and the addition of a Velux window ensures that the workshop is always showered in natural light. The space comprises a number of machines; everything that Peter needs to make his vessels from beginning to end. 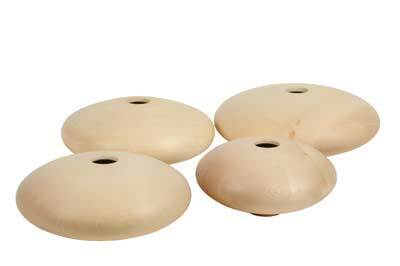 "I use Henry Taylor tools for turning and the small Rolly Munro tool for hollowing. 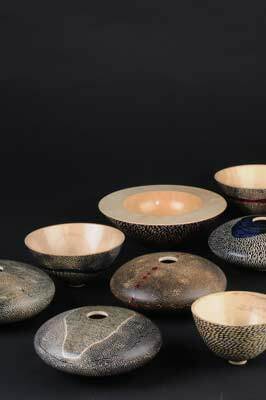 I finish many of my pieces with shear-scrapers, and for bowls, I use the 6mm (1/4in) tool," he says. If Peter could change one thing it would be to have a bigger workshop. As this space is not huge, Peter has to store a number of sycamore boards in the workshop below his - not an ideal situation - but luckily he has understanding neighbours. Peter has also appeared in a number of other publications including Sussex Life and a one-page article within Period Living magazine last year. 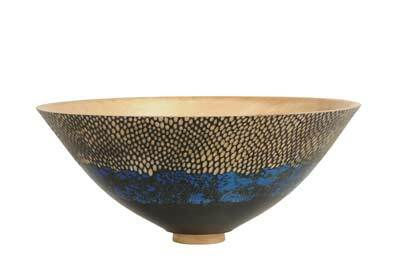 He also received a commission for the Parliamentarian of the Year Awards where he was asked to make three samples, and finally, eight carved-rim bowls. Other commissions include the Place Prize for Contemporary Dance and being chosen to take place in the Chelsea Crafts Fair and Origin, the London Craft Fair, for several years. It should also be noted that Peter cites these events as the high points of his career so far. In terms of influential people, Peter admires Bert Marsh and finds that his philosophy on life is very inspirational. He first met Bert at the Chelsea Craft Fair many years ago, where they were both exhibiting artists. Peter tells me how he hasn't missed painting yet and feels there is still time to explore many different creative areas. Making the best of what you've got is, according to Peter, a good attitude to have. He thinks he should probably have started turning earlier, but is aware that the past is what it is. I am struck by the fact that Peter has very strong feelings about his work - he certainly knows what he does and doesn't like - he is definitely a man with passion for the work he produces. Another thing that strikes me is how modest he is about his work, which certainly is not a bad thing. "My work is made with a modest and down to earth material and I try to assess it honestly, and with one-off pieces, things don't always work. I believe that you should be ruthlessly honest with yourself when assessing your own work and put things down to experience when they don't come up to scratch and be prepared to reject them," he finishes. Peter never designs the pieces he makes; it is a fluid and artistic process. He notices how the work has evolved quite dramatically over the years. For instance, the work he is producing now is very different to what he was making two years ago. 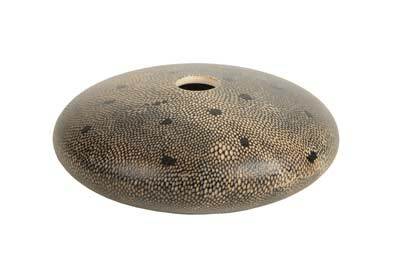 In terms of the future, Peter wants to move on with his work, creating larger vessels and still retaining a very tactile element within his pieces. In a couple of years' time he wants his work to be very different to what it is now. "If it hasn't changed I would be disappointed. I would certainly hope that the work continues to evolve." Peter gets a big kick out of people liking his work, but is very embarrassed about some of the pieces he has made, or the â€œfailuresâ€� as he calls them. He is his own worst critic, and apparently asks himself, "what was I thinking when I made this?" about a number of the pieces in his workshop, which are mostly hidden. Luckily, Peter does allow some concessions for his so-called â€œfailuresâ€� because he believes there is no such thing as the perfect piece. I am very intrigued to see how Peter's work evolves over the years, and I will certainly keep in touch with him. It was a pleasure to meet Peter and to get a taste for the work he produces, and also what goes into producing the individual items. I can see that each one of his vessels is made with love, care, and a vision, with each piece encapsulating Peter's passion for what he does. See his website for more information and more examples of his superb work.